Last Updated: April 17, 2019 · Published: July 9, 2018 By: Asian Caucasian Leave a Comment This post may contain affiliate links or sponsored content. What do you get when you cross a Maine lobster with a Vietnamese sandwich? A Lobster Bánh Mì, of course! Just returned from a trip to Cape Cod and got über inspired from eating my fair share of lobster rolls! Who doesn’t love lobster rolls, after all? It’s THE classic New England sandwich! So, I present to you my version of an Asian lobster roll! Crispy, tangy, and decadent, this Lobster Bánh Mì sandwich will knock your socks off! The lobster salad has incredible flavoring and a bit of heat. The tangy pickled coleslaw topping rounds out the flavors so beautifully. I didn’t have Bánh Mì rolls handy so I used French baguettes (sacrilegious to the Vietnamese but works in a pinch!). You can find these Vietnamese rolls at your local Asian market and Vietnamese bakeries. There’s no need to go to New England this summer to enjoy this delicious Asian-inspired lobster roll. You can make this in your own kitchen! 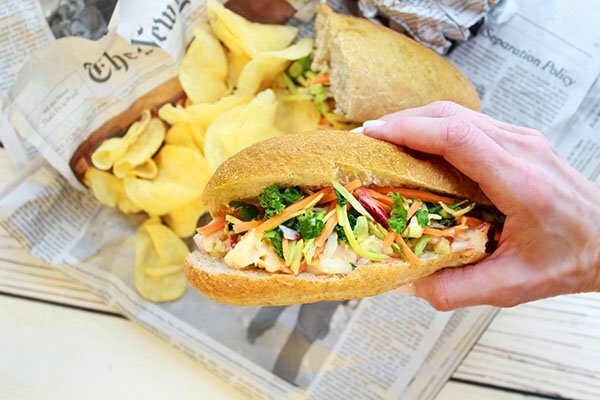 Crunchy, punchy pickled vegetables top off an out-of-this-world Lobster Bánh Mì sandwich! 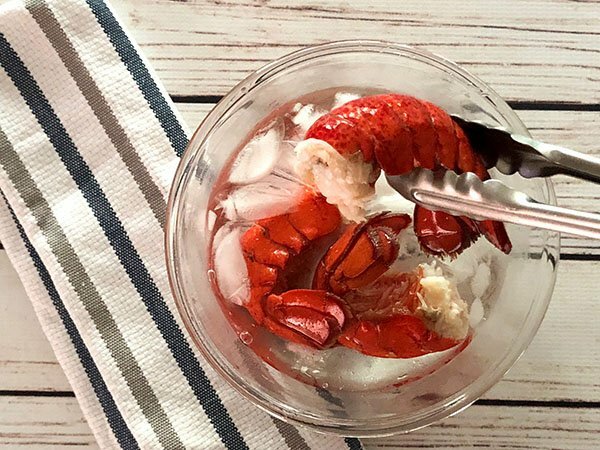 The lobster tails go from boiling to an ice bath before removing them from their shells. 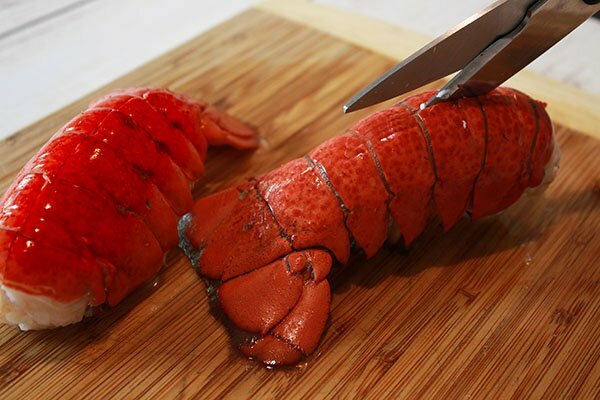 Cooking scissors are the easiest way to slice the cooked lobster tails. You can easily remove the meat from the shells once cut. This flavorful lobster salad is the base for this Bánh Mì sandwich. This is great as a stand-alone lobster salad or on top of lettuce as well! I paired this Lobster Bánh Mì with a side of Cape Cod Potato Chips, of course!! 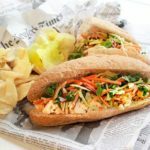 Delicious and easy to prepare, this Vietnamese Lobster Bánh Mì is the perfect New England summer sandwich with an Asian twist! 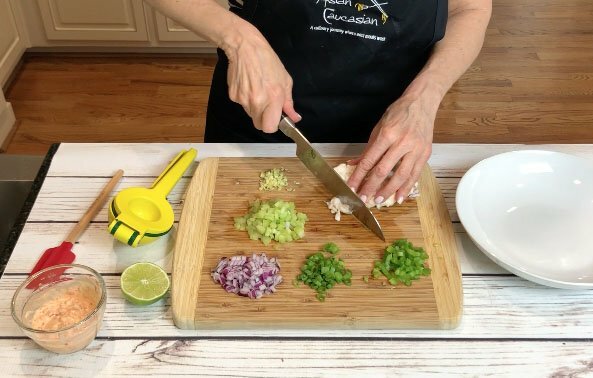 In a large mixing bowl, stir together the lobster meat, celery, red onions, green onions, jalapeño pepper, lemon grass, lime zest, and cilantro. In a small bowl, mix together the mayonnaise and sambal oelek and fold it into the lobster salad mixture. Slice the French baguettes, or Bánh Mì buns, almost through but not all the way leaving enough room for the lobster salad. Set aside. Place the coleslaw into a medium mixing bowl. In a small mixing bowl, whisk together the rice vinegar, water, sugar, and salt and toss it into the coleslaw mix, along with the cilantro. Set aside. 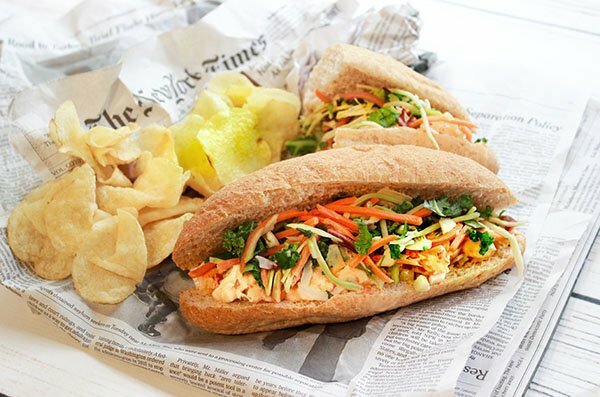 To assemble the Bánh Mì sandwich: Place the lobster salad mixture on the bottom of the roll with the slaw mix on top. Cut in half if desired. You can find the Bánh Mì rolls at your Asian market or select Vietnamese bakeries. 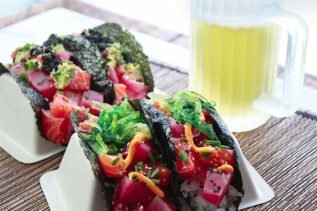 If you liked this recipe, try our Sushi Tacos with Salmon and Tuna.